Olin Cordell has been named the Class of 2019’s STAR Student. 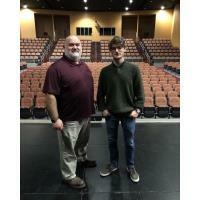 He is pictured with his STAR Teacher, Mr. Alan Tolbert. The Student Teacher Achievement Recognition (STAR) program honors Georgia’s highest achieving high school seniors and the teachers who have been most instrumental in their academic development. The Professional Association of Georgia Educators (PAGE) sponsors the program that recognizes one senior at each high school with the highest score in any single test day of the SAT. Mr. Tolbert was likewise named STAR Teacher of the year. Congratulations to both on there dedication and excellence in Hart County schools! For more information on Olin or Mr. Tolbert, please contact Hart County High School principal Kevin Gaines at kevin.gaines@hart.k12.ga.us or 706-856-7208.